The Egyptian Exchange (EGX) finished Sunday’s trading session in the green boosted via a buying trend by foreign and Arab traders. The benchmark EGX30 index jumped 58.09 points, or 0.39%, to 14,840 points, while the EGX70 index inched up 0.12%, reaching 686.34 points. The EGX100 index edged up 0.13% to 1,743 points, while the equal-weighted EGX50 index levelled up 0.58%, finishing at 2,419 points. The EGX’s trading volume reached 122.9 million shares, through 15,900 transactions, generating EGP 478.7 million. Egyptian traders were net sellers with EGP 445.4 million, while foreign investors were net buyers with EGP 306.56 million, and EGP 138.8 million, respectively. The heavyweight Commercial International Bank (CIB) stock rose 0.51% to EPG 68.61 with a turnover of EGP 24.18 million. 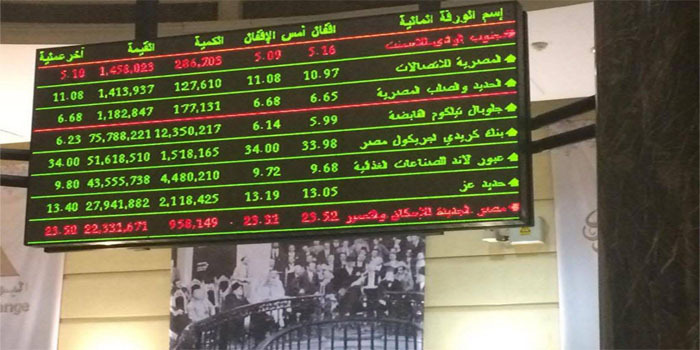 The bourse’s market capitalisation increased by EGP 2.5 billion to end at EGP 823.33 billion.